A ringtone is more than just an incoming call alert. As much as our ringtones are designed to alert us to incoming phone calls, they are also a great way to express our amazing personality. Many people love country music. With a varied collection of country music ringtones today, you can easily find a favorite, set it as your ringtone of choice to give your phone a unique acoustic effect. Learn how to get free country music ringtones for iPhone. Find easy step-by-step processes on how to download and customize country music ringtones for iPhone. Part 2: How to Transfer Country Music Ringtones to iPhone after Downloading? Part 3: How to Customize Country Music of Your Own for iPhone with Third-Party Program? Have you just purchased a new iPhone? Are you already getting fed up of the default ringtone? You are not alone. It is even more difficult to tell whose iPhone is ringing when you hear the tone in public places. To avoid this awkward situation, here are the top 5 websites for downloading country music ringtones for your iPhone. If you are looking out for a unique sound that feels more creative than the original music, zedge is your go-to website. It has a sleek, modern interface with a wide variety of resources including ringtones, wallpapers, and themes. You can either download a pre-made country music ringtone or even make use of their online tools to customize your own ringtone. This is another top website where you can download free country music ringtones for iPhone. You would find a large number of ringtones you can select from. 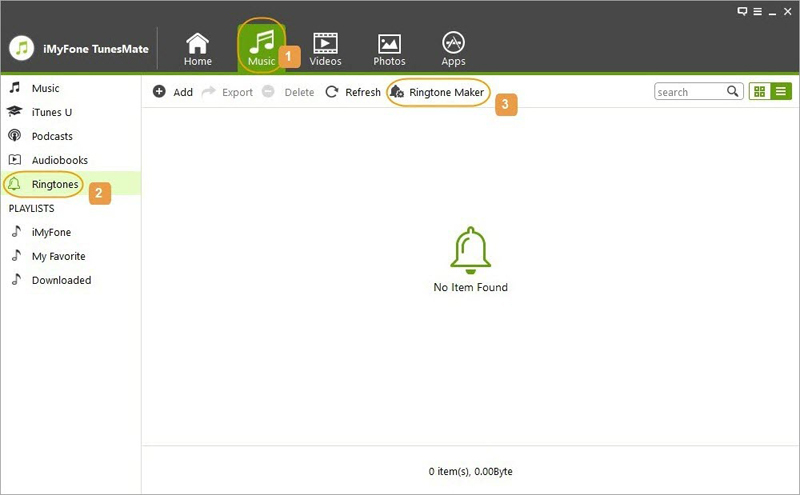 Interestingly too, you can even listen to the country music before downloading, and decide on whether you need the ringtone in M4R or MP3 format. This is also a top website for downloading free country music ringtones. The juicy part of using mob.org is that you can search for songs under a list of artists and genres, and as such, you can conveniently download songs from your favorite musician by either clicking the download tab or scanning a QR code. This is another source of great ringtones of high quality. You can choose to download the ringtones in either MP3 format or the default M4R format for iPhone 6s/7/8/8 plus/X. This website allows you to listen to top country music ringtones and download them to your computer freely. 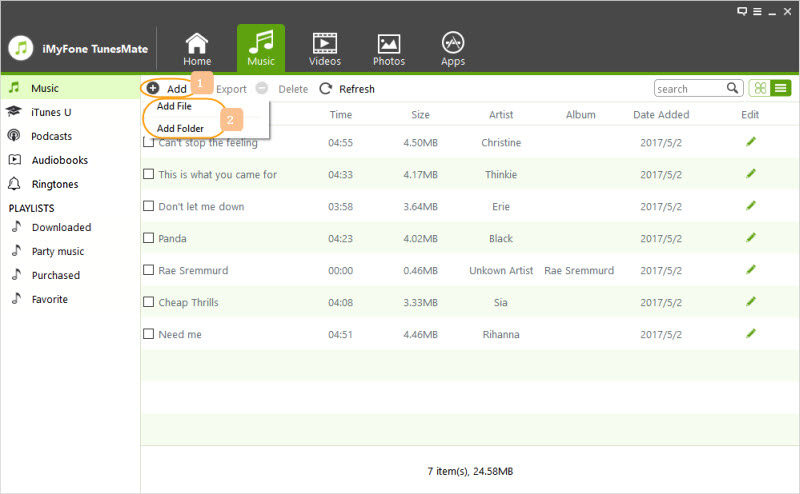 You can even share any song you really like through social media platforms such as Twitter or Facebook. Although ringtones can be really great sounds on iPhone, the restrictions on iTunes make it very difficult to deal with, especially when you update iTunes to version 12.7 or later that have Tones tab hidden. However, there are third-party apps that help you transfer country music on iPhone after downloading. 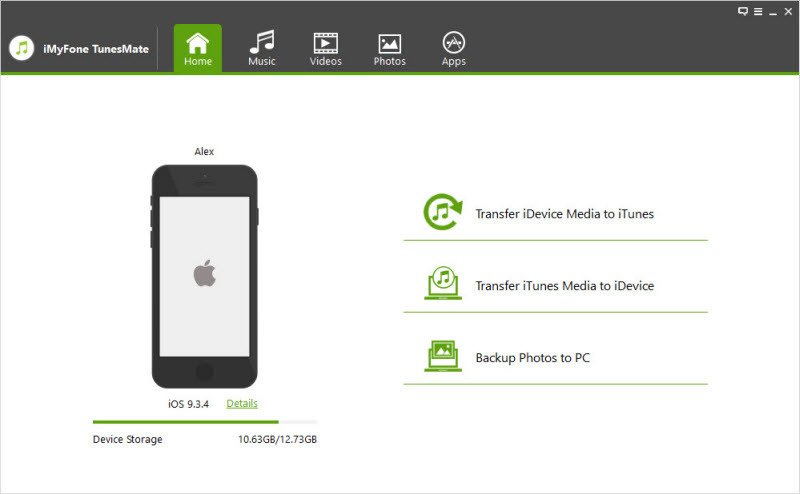 iMyFone TunesMate iPhone Transfer is a great app that allows you break through the restrictions on iTunes. Here are a few steps to follow in order to transfer country music ringtones on your iPhone after downloading. 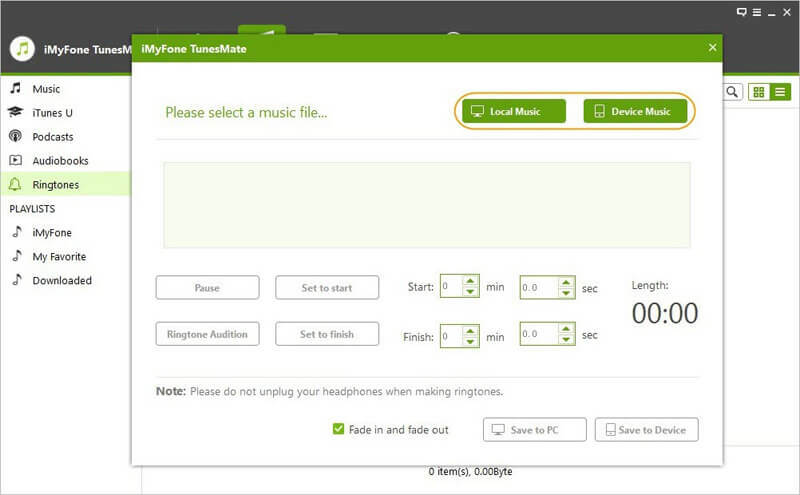 Step 1Download and install iMyFone TunesMate to your PC and connect your iPhone to the computer. Step 2Launch iMyFone Tunesmate, and click on "Music". You would find different categories on the left sidebar. Click on "Ringtones". Step 3Click on "Add > Add File", then search for your preferred already downloaded country music ringtone. Step 4Choose ringtones and click "Open" for the sounds to be transferred to your iPhone. After transferring, you now have ringtones on your iPhone, and then you can change ringtones on your iPhone. You can select your preferred part of the sound as your ringtone. You can edit and delete the custom ringtones without iTunes. Before saving the custom ringtone to your iPhone or PC, you can preview the track. You can transfer the custom ringtone from PC to iPhone without syncing with iTunes. As such, iMyFone TunesMate offers users a variety of options to create custom country music ringtones for iPhone. 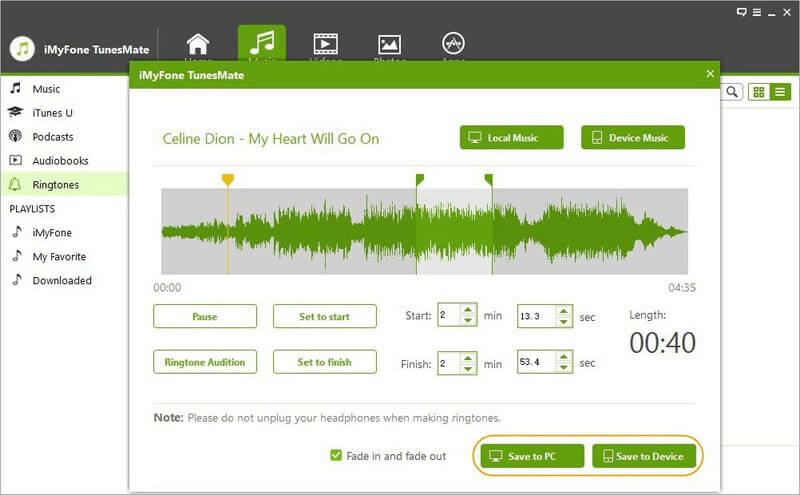 Here are detailed steps that will help you use iMyFone TunesMate to create custom country music ringtones. Step 1Launch TunesMate on your PC and connect your iPhone to the computer. Step 2You would find "Music" at the top of the program, click on it and tap select "Ringtone" from the left side bar. Step 3Click on "Ringtone Maker" so you can convert the country music to a ringtone. A window that offers all the tools for the customization will appear. Depending on where you have already stored the music, click on "Device Music" folder or "Local Music" folder. Step 4Make use of the editing features you find on your screen to adjust the length of the track to 40 seconds or less. 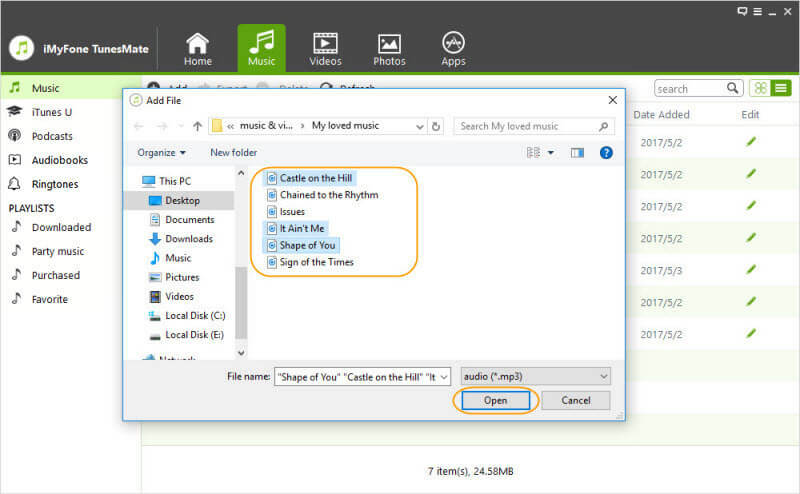 Step 5Once you have successfully edited the song, click “Save to Device”, and you will be able to set it as your ringtone when the transfer is complete.